Department of Health Sciences, Università del Piemonte Orientale "A. Avogadro", Novara, Italy. 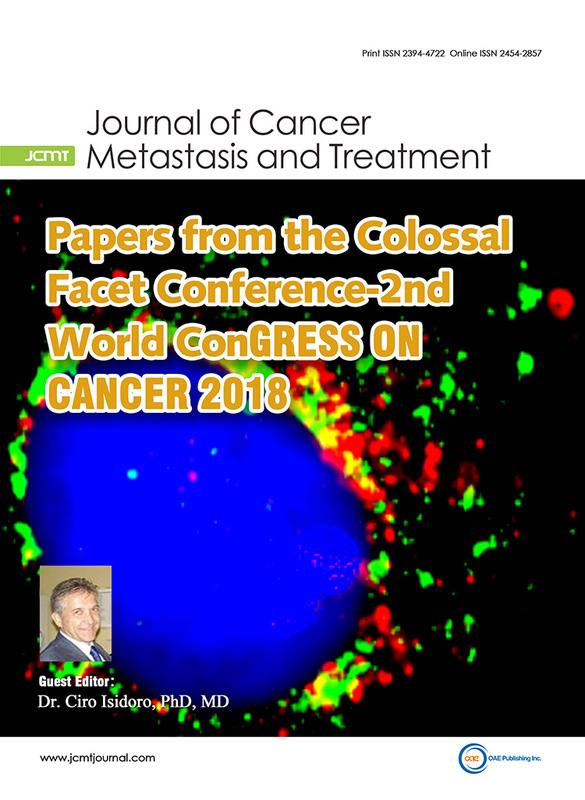 This Special Issue of Journal of Cancer Metastasis and Treatment is dedicated to the proceedings of the 2nd World Congress on Cancer 2018 held in Bologna (Italy) in July 23-25. The theme of the Conference Cancer-2018 was "Oncology and Cancer therapeutics in the 21st century". Goal of the meeting was to share the foremost updated knowledge on the biology and the novel therapeutic options in Cancer. The conference focused on the mechanisms of cancer development, on the relationship between tumor microenvironment, metabolism and Cancer progression, novel technologies for early detection, and on novel pharmacological approaches to treat cancer patients. Major topics included epigenetics, inflammation, drug resistance, cancer stem cells, autophagy, cell metabolism, experimental models, biobanking, immune response, cachexia, molecular diagnosis, biomarkers, patient clinical care and complementary phytotherapy. This Special Issue will cover the researches at the cutting edge in the study of the biology and clinical care of Cancer presented at the Conference. Invited Speakers, Poster presenters and participants can contribute to this special issue with either an extended abstract (no page limit), Commentary, Original articles and (mini) review articles. Inclusion of schemes, Figures and Cartoon summarizing the results is strongly encouraged. An ‘ad hoc’ editorial team will oversee the peer review of research and review articles.